Schaulager, Basel, The Museum of Modern Art, and MoMA PS1 present the first comprehensive retrospective of American artist Bruce Nauman (b. 1941) in over 20 years. Opening at Schaulager in March 2018 and traveling to New York in October of that year, the exhibition expands upon the rich holdings of the organizing institutions. Spanning the artist’s entire career, from the mid-1960s to the present, Disappearing Acts provides a singular opportunity to experience his command of a wide range of mediums, from drawing, printmaking, photography, and sculpture to performance, film, neon, and large-scale installations. Disappearing Acts traces strategies of withdrawal in Nauman’s work—both literal and figurative incidents of removal, deflection, and concealment. 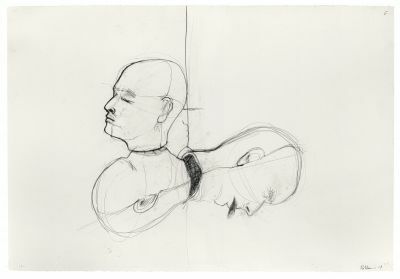 Bodies are fragmented, centers are left empty, voices emanate from hidden speakers; the artist sculpts himself in absentia, appearing only as negative space. The installation proceeds chronologically (albeit with strategic pauses and breaks), granting ample space to the artist’s production across the decades. Nauman’s consummate skill as a draftsman, which has not been the focus of a retrospective since the mid-1980s, will be highlighted with a broad selection drawings, ranging from quick sketches to oversized, highly worked sheets. The exhibition will be on view at Schaulager, Basel, March 17–August 26, 2018.
video, Seven-channel video (color, sound, continuous duration), dimensions variable.